In "If the (Sports) Shoe Fits"—coming out in the next issue of Caltech magazine—we will be taking a look at a cross-section of alumni who have taken their Caltech degrees into the world of athletics. Here, as the 2018 Winter Olympics kick off in Pyeongchang, South Korea, we consider those Caltech competitors who have taken their athletic prowess to the Olympics over the years: vaulting over the high bar, taking on the middle-distance run, and hurling the javelin. And let's not forget that today's Caltech Beavers are headed up by a gold- and silver-medal-winning Olympic swimmer. While still an undergraduate, Graham claimed a silver medal in the pole vault, contributing to the U.S. team's 32 medals at the 1924 Olympics. 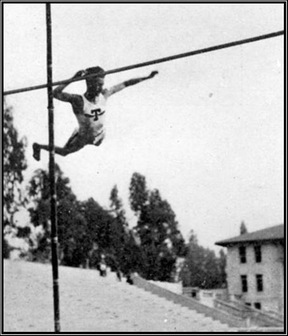 He continued his Caltech career as captain of the 1926 pole-vaulting squad, which tied Occidental College for the SCIAC Championship—the Beavers' first in any sport. The year before, Graham had led the Beavers to an undefeated dual-meet record while clearing what still ranks as the sixth-highest bar in program history at 13 feet, 2-7/8 inches. Having emigrated to the United States in 1925, Skoog set program records in the 1-mile and 880-yard runs as well as the 3-mile cross-country distance during his time at Caltech. At the Olympic Games the summer following his graduation, Skoog represented Sweden in the 1500-meter run, placing sixth in his heat and missing a place in the final by a mere 0.8 second. Conley—who competed on the football, basketball, and baseball teams, as well as track and field, while at Caltech—qualified for the final round of the Melbourne Olympics with a throw of 68.50 meters, then recorded a 69.74 mark for his farthest throw, bringing him in at 10th place. He continued competing well after that summer, earning a silver medal in the 1959 Pan American Games and recording a career-best throw of 79.30 meters in 1964. The three Caltech Olympians highlighted above are all members of the Caltech Hall of Honor. 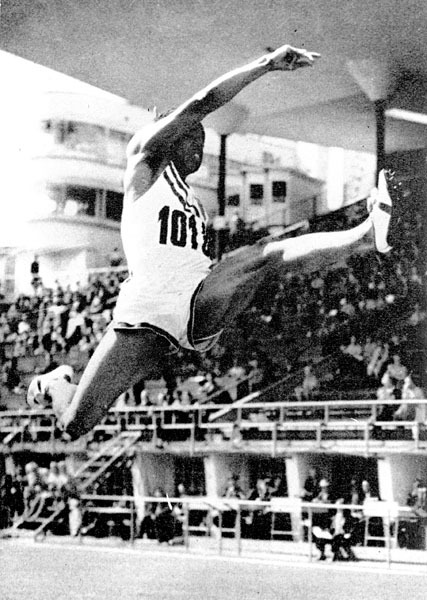 As an undergraduate at Cornell University, Gourdine competed in the 1952 Summer Olympics in Helsinki, winning a silver medal for the long jump when he came up just one and a half inches short of Jerome Biffle's golden-medal jump. “I would have rather lost by a foot,” he said years later. After serving in the U.S. Navy and earning a doctorate in engineering from Caltech, Gourdine worked at JPL from 1958-60. He went on to open Gourdine Laboratories, a research laboratory in New Jersey, and to found Energy Innovation, Inc. in Houston, Texas. Before beginning her coaching career, Mitchell swam competitively for more than 10 years. As a member of the U.S. team at the 1984 Olympics in Los Angeles—while still in high school—she won a silver medal in the 100-meter backstroke, as well as a gold medal as a member of the 400-meter medley relay. She earned a third Olympic medal—another silver—at the 1988 Olympics in Seoul, South Korea, as part of the 400-meter medley relay team. In between Olympics, Mitchell set the world record in the 200-meter backstroke at the 1986 World Championships, a mark that stood for five years. In 1999, she was inducted into the International Swimming Hall of Fame.